Check out some pictures from our Night of Good Fortune Event, benefitting Make-A-Wish Iowa! Laughlin Law Firm and Make-A-Wish Iowa thank everyone that attended and contributed to such an amazing cause! Last weekend, Laughlin Law Firm spent some time in the sun and on the water with some of Des Moines' finest real estate professionals. Does This 2017 Iowa Decision Affect Your Real Property Contract Rights? Every homeowner’s association or property management group is subject to certain covenants and restriction found in the real estate contracts. There is often a right of first refusal included in these contracts, providing the original seller with the right to deny the buyer from selling the property. The right of first refusal must be renewed within 10 years of when the interest appears of record by filing a written statement of extension in the county land records. The following is an explanation of recent case law in Iowa dealing with “the right of first refusal.” In this case, the court held that an extension must be filed at the expiration of the ten-year period, or the right of first refusal is no longer enforceable under Iowa Code section 614.17A (2016). Section 614.17A applies to the facts of this case because the scope of the statute is an “interest in” real estate. Westlake Properties LC and Greenspon Property entered into an agreement to set up Greenspon’s purchase of Westlake’s property in 1997. An addendum to the purchase agreement provided Greenspon with the right of first refusal to purchase an adjacent lot. The notice of the sale and the right of first refusal were properly recorded in 1997. Westlake held onto that lot and eventually filed a quiet title action in April of 2016 alleging that Greenspon’s interest should be extinguished in accordance with 614.17A because they did not file a verified claim on or before ten years after the original filing. Greenspon alleges that section 614.17A should not apply to the facts of this case because the claim arises under contract law, not against real estate. This case is used to decide whether the right of first refusal is “an interest or claim to real estate” subject to 614.17A and should be extinguished after ten years if it is not renewed. Section 614.17A(1) states ‘after July 1, 1992, an action shall not be maintained in a court, either at law or in equity, in order to recover or establish an interest in or claim to real estate’ if: (1) the claim arose or had been in existence for more than ten years; (2) the action is against the record-titleholder to the real estate in possession; and (3) the record-titleholder and his or her immediate or remote grantors have held chain of title to the real estate for over ten years. The Rule Against Perpetuities applies to right of first refusal. In Trecker v Langel, the objective of the Rule Against Perpetuities is to keep property freely alienable. 298 N.W.2d 289 (Iowa 1980). Under Iowa Code section 558.68, the Rule Against Perpetuities applies to “nonvested interests in property.” And in In re Estate of Claussen, it is held that option agreements are executory interests in property. 482 N.W.2d 381 (Iowa 1992). Option agreements and rights of first refusal are similar. The marketable title act’s goal of improving the system for transferring real property should subject first-refusal rights to 614.17A’s recording demands. The majority of jurisdictions treat the rights of first refusal as a property interest and not merely contract rights. In In re Estate of Hord, a claim involving a future interest arises or exists when the interest appears of record, not when it vests, becomes possessory, or becomes actionable. 836 N.W.2d 1 (Iowa 2013). A right of first refusal falls within the scope of an “interest in” real estate and must be renewed through a verified claim within ten years of its original and respective filing dates. Greenspon’s property interest arose when the parties reached a contractual agreement regarding the right of first refusal on the adjacent lot and Greenspon recorded it in 1997. Greenspon’s failure to renew its interest before 2007 (ten years after the initial filing) led to its expiration. If you have any questions about this case or the relevant case law, or are concerned about preserving any of your interests in real estate, please contact Jason Laughlin or Jeff Perkins at (515)608-4797. You can also email them at Jason@laughlinlawfirm.com or Jeff@laughlinlawfirm.com. The adoption of digital signatures, electronic signatures or “e-signatures” upon real estate transaction documents is now unavoidable in today’s ever-changing real estate market. As their acceptance gains steam, we’ve found many buyers, sellers and even their professional representatives may not fully appreciate under what circumstances e-signatures may be used, and where their use is inappropriate. Accordingly, we thought we’d visit some frequently asked questions by some of our clients and their representatives in the context of a typical residential real estate settlement. By no means is this post exhaustive of the subject. Contact your attorney, lender or settlement service provider for specific requirements. What is meant by “e-signature”? Although deceptively simple, it is best to know precisely what defines an “e-signature.” A good place to start is to consider what an e-signature is not. It most definitely is not a “wet signature,” or putting pen to paper. It is also not the practice of simply pasting a pre-existing signature image to a digital image or document. Nor is it inscribing an “/s/” near one’s typewritten name. And it is definitely not the same as using the italics font on Microsoft Word. An e-signature is a legally authenticated signature conforming to the requirements set forth under the Electronic Signatures in Global and National Commerce Act (the “E-SIGN Act”), in combination with various state and local acts, and having the effect of being equal to the original paper copy documents from which they derive. Essentially, a proper e-signature is obtained through a service that initiates a verification process with the signatory thereby creating a digital fingerprint generating and storing an audit trail that can uniquely identify the person signing. Of course, the generation of this information, as well as the storage of this information, is the backbone to making this process legitimate, and it must be done in accordance with the law and its related rules and regulations. In practice, these legal standards are typically met by setting up an account through a third-party service willing to bear the responsibility of compliance. Hence, any party accepting a digital signature on a document should have already met the pre-requisites for obtaining and storing e-signatures before they begin considering how they will go about garnering digital signatures on documents. Typically, the e-signings we encounter are administered through professional vendors such as Adobe, Dotloop, and Docusign. What are the general governing laws on e-signatures? What does Iowa law say about e-signatures? In part, Iowa law defines “electronic signature” as an electronic sound, symbol, or process attached to or logically associated with a record and executed or adopted by a person with the intent to sign the record. The chapter applies only to transactions between parties each of which has agreed to conduct transactions by electronic means. Whether the parties agree to conduct a transaction by electronic means is determined from the context and surrounding circumstances, including the parties' conduct. A signature, and a resultant contract derived therefrom, cannot be denied legal effect or enforceability solely because electronic signatures are used. However, should another law provide that a record be presented in a particular way, posted in a particular place, sent, communicated or transmitted by a particular method, the record must be presented accordingly. The authenticity of an electronic signature may be shown in any manner, including showing the “efficacy of any security procedure applied,” in determining whether a signature is actually attributable to the person so specified. Changes or errors in an electronic record occurring in a transmission between parties to a transaction, may have significant consequences. Nonconformance to agreed upon procedures may mean that one party can avoid the effects of an erroneous record. However, the avoiding party must fulfill certain requirements to avail themselves of this protection. Notice of the error is but the first step. What does Iowa law say about notarized documents using electronic signatures? Put simply, notarial officers may use electronic signatures so long as the substance of the notarial block has the information required by laws associated with the act. As of this writing, the law states electronic notarization in Iowa must be done by a notary public who has not only notified the Secretary of State’s office prior to electronically notarizing anything but also has received approval of their methods for notarization and “stamping” by the Secretary of State. How are County Recorders treating electronic signatures? Predictably, the County Recorders are somewhat hesitant to go headlong into electronically signed documents let alone paperless submissions. The Iowa Code affords some room to evolve by granting governmental agencies of this state the deference to determine whether, and the extent to which, the agency will create and retain electronic records and convert written records to electronic records. This is where further regulations by the Secretary of State and the Department of Administrative Services are a factor. We contacted some Recorders’ offices to discover they are still hoping to see more bright-line guidance from the Secretary of State when it comes to handling any type of electronically executed documents in Iowa. Hence, the default setting right now for 99 offices throughout the state is skepticism. Something to consider for paper instruments submitted with electronic signatures is that any document that must be recorded with a County Recorder’s office will not be accepted if it does not satisfy their standards for execution. The universal barrier to acceptance by the County Recorder is whether a document has a proper acknowledgment, and electronically signed instruments are going to be subjected to higher scrutiny to be sure they meet those requirements. Acknowledgments in Iowa, whether signed in ink or electronically, must still be issued by an approved notary who witnesses the signatory act in person. That standard for proper acknowledgment alone advocates for maintaining the status quo. For all practical purposes, it has yet to make any sense for the notary and signers to use any means other than the tried and true wet signatures if everyone needs to be in each other’s presence. What do federal laws say about e-signatures on real estate settlement documents? There are common instances when an e-signature may be used on settlement documents that are not a part of the deed (or transfer) package, i.e. those documents required to settle a loan during a real estate closing transaction as defined under RESPA. In 2008, HUD issued a RESPA Reform Rule (73 Fed. Reg. 68204, November 17, 2008) that included substantive and technical changes to the existing RESPA regulations and different implementation dates for various provisions. In addition, HUD clarified that all disclosures required by RESPA are permitted to be provided electronically, in accordance with the E-SIGN Act. See 15 U.S.C. 7001 et seq. The Consumer Finance Protection Bureau (“CFPB”) has further stated its acceptance of e-signatures on any such instruments so long as they comply with the E-SIGN Act’s disclosure, consent, signature, presentation, delivery, and retention requirements. See 12 CFR 1024.3. The Federal Housing Authority (FHA) adopted consistent, but more stringent, requirements on accepting e-signatures. The FHA accepts e-signatures on all documents contained in the Mortgage Insurance Endorsement Documents binder. Additionally, FHA accepts e-signatures on documents associated with servicing or loss mitigation services, insurance claims documentation, and HUD Real Estate Owned (REO) documents. However, they will not accept e-signatures on any Note for HECM mortgages. Interestingly, the FHA also states explicitly that it will not accept any voice or audio signatures. Again, it is incumbent upon the mortgagee to ensure close adherence to the E-SIGN Act requirements, and the FHA expects the mortgagee to obtain any Authoritative Copies (as that term is defined in the Act) of the signatures and be their safe keeper. See 4000.1 II.A.i.a.i.(A)(4). Who decides whether an electronically signed closing document is acceptable, and what’s the big deal? As stated earlier, the County Recorder plays a significant role as gatekeeper in validating transfer documents. The whole transaction will not be valid if the transfer documents are not properly recorded. Even if an e-sign transfer document should get past the County Recorder’s scrutiny, you can safely bet that the next title examiner to review the abstract containing such an entry will call out an objection if it does not align with the rules. Ultimately, that may cost the party “signing” (or their representative) to Simply lose time and money in correcting the deficiency, or it could also have the more serious effects of invalidating a property transfer or destroying notice of a mortgage to third parties. And that is but the tip of the liability iceberg. Additionally, the decision on whether to accept an otherwise legally e-signed real estate settlement document is left to the individual policies adopted by each individual lender. Any settlement agent who represents a lender is going to defer to their client’s policy in each and every instance. In most instances, the requirements will vary as each lender seeks to satisfy the requirements of their many “secondary market” service providers. To be sure of those requirements, always contact your lender or their settlement agent to ascertain what’s appropriate. Also, if an e-signature does not meet these requirements, any document signed using an e-signature, such as loan application forms or closing disclosures will not be valid under federally-applicable laws and regulations such as the Truth in Lending Act or Real Estate Settlement Procedures Act. Last but certainly not least, there is the issue that is at the central concern of all these policies: fraud. It’s no secret that fraud runs rampant in the real estate industry. With a typical residential transaction involving hundreds of thousands of dollars, it is a veritable feeding frenzy for scam artists and hackers. Increased use of e-signatures simply invites additional opportunity for these criminals to access assets, so it would seem only appropriate if many of these institutions are somewhat hesitant to dive in to this technology before these newer standards have proven to be tried and true. It may be difficult to confirm or prove that a typed name or mark was (or was not) intended to be an e-signature. It may be difficult to confirm or prove that an informal exchange of e-mails was (or was not) intended to be an e-contract. It may be difficult to confirm or prove that the person to whom an e-mail was sent (and not a third party with access to such person’s computer) was the person who responded with an e-signature. It may be difficult to prove that the other party to the e-contract altered it after its execution. To date, there are no published cases discussing what constitutes an “e-signature” under the laws and, as such, the boundaries are still blurred, so REALTORS (and lenders and other businesses) need to exercise care in their electronic transactions with customers to avoid being (or to ensure they are) contractually bound. That said, be aware that laws, rules and regulations, and lender preferences are evolving dramatically. With increased lender use of “electronic closings” and the potential advent of blockchain technology in real estate transactions, we are sure to see an ever-expanding use of the e-signature and developments in paperless security in our industry. Staying current on use of e-signatures is paramount. Note however that any efficiency that may have been gained through application of an e-signature is quickly lost if used in the wrong context. Communicate liberally with those document “gatekeepers” with which you regularly conduct business. It will save you a great deal of time and effort. Update Regarding Homestead Tax Credit Applications! Those of you who are avid followers of the Laughlin Law Firm blog (which we know all of you are!) will have noticed that we recently began looking into what counties in the mid-Iowa region are equipped to allow homeowners to apply for their Homestead Tax Credit applications online. In doing so, we discovered that certain county sites published a requirement that a person must file their application in person. That prohibition seemed off, so we did some extra digging into the Iowa Code and the Iowa Administrative Code. Then, we inquired with the Iowa Department of Revenue and posited that such policies were invalid and inconsistent with state and administrative law. The Department said they would look into it and get back to us. Sure enough, they did and they agreed. Not only that, they have since taken the initiative to notify all assessors’ offices that they are required to allow both personal and mailed forms of the application! The letter below was their notice to the assessors. We invite you to put it in your closing binder packet to better reflect your services to your clients. Better still, you can rely on us to bring it to the close since we now include that information in our closings. Either way, now you can confidently advise your clients of their Homestead Tax Credit Application mailing rights and give them one more reason to leave the closing table impressed with you and your services. Another successful DMAAR Annual Event in the books! Here's a photo of just some of our talented real estate friends with our team members. We truly value our relationship with DMAAR, and our hats are off to all of the award participants, nominees and winners from Friday. We can't wait for next year! Sometimes we have the honor and the privilege of seeing the exact right person take a podium and say the exact right thing. Chief Justice Mark Cady is that person, and his remarks at the 2018 Condition of the Judiciary were just what needed to be said. In his address, the Chief Justice explained the incredible return on investment the courts have provided. He touted the successes of risk assessment tools and diversionary programs that have saved lives and significant costs to the state regarding problems such as incarceration, addiction, and recidivism. Saving money and improving people’s lives is something everyone can support, yet these programs are in a limbo of underdevelopment because of the freeze the legislators have placed on the third branch. Knowing this, the Chief Justice not only talked about the return on financial investment, he also spoke about the return on investing in Iowa’s legacy. Accordingly, he pointed out that 2018 marks the 150th anniversary of the Clark v. Board of School Directors decision. That 1868 decision deemed the Muscatine School Board’s adoption of “separate-but-equal” policies that banned an African-American 12 year-old girl named Susan Clark from attending an all-white school to be inconsistent with equal rights as defined by the Iowa Constitution. The policy was struck down as unconstitutional, and similar policies had to be abolished. And the state of Iowa–along with our collective conscience as Iowans–was the better for it. It took the United States Supreme Court 86 years to catch up to that reasoning when it decided Brown v Board of Education in 1954. This is one of several examples of Iowa being on the right side of history thanks to its judiciary. The Iowa Supreme Court’s original 1839 decision, In re Ralph, declared a black man a person and not chattel. The U.S. Supreme Court held otherwise 18 years later and the Constitutional crisis that spawned the Civil War had to settle the matter. The 1873 decision in Coger v. The North Western Union Packet Co. held that a black woman was entitled to the same rights and privileges of public accommodation 91 years before the U.S. Supreme Court. Arabella A. Mansfield was the first woman in the nation admitted to practice law, and she did that here in Iowa in 1869. We don’t need to reach back over a century to appreciate these moments. All of us can recognize the significance of the Varnum decision in 2009, which was again ahead of the curve. Here is the difficult truth in all of these proud moments: it was not the Iowa electorate nor their elected officials who made this progress happen. It was the plaintiffs and applicants themselves who endured and had access to a District Court and Appellate Court system with the ability to disqualify such injustices. The Clark family and all others turned to the courts because it was their only option. Frankly, the support of their neighbors and legislators was not significant enough for their rights to be recognized. It was the role of the judiciary that realized our better ways. Today, all of us who know this judicial legacy proudly proclaim it and beam with pride at predecessors and contemporaries. Indeed, the judiciary has not just returned investments for our pocketbooks, they have returned investments on our collective soul. But what have we the people done to be on the right side of history? Chief Justice Cady, as one of many, has been bearing that cross for us, and we need to support them. This is a call on fellow Iowans and those with a seat under that golden dome to have the courage to alleviate the financial strains that have been starving our judiciary. Every person in that chamber on that day not only gave the Chief Justice applause as he exited, he was the recipient of a raucous ovation. Hurrahs and cheers ushered him as he walked out of that hall. Everyone reveled in our historic pedigree and thanked him and his colleagues for their part in it; however, clapping does not spare the legislature nor us citizens from fulfilling our role in this story. Staking claim to the legacy of our third branch should not be warranted without doing what we can to support it when we are called upon to do so. The legislative and executive branches need to take action. The judiciary needs a 7.9% increase in funding to stay current on its bills and accessibility. “The money just isn’t there” is no longer acceptable. We the people need to do it for their sake, as well as our own. A person without a vote is a person without protection. Such was the thinking of Lyndon B. Johnson and every proponent of democracy before and after him. In the wake of the amendments to the Iowa Code’s voter registration and election provisions taking effect, make sure to check the Secretary of State’s rather thorough list of FAQs explaining the implementation of the new measures. The simplest takeaway is that a registered voter with a state ID/driver’s license will be fine showing up to their proper polling site with that in hand. That leaves the big question on everyone’s mind of how one can vote without an Iowa ID/Driver’s License. This is an especially fair question for the state’s influx of new Iowans who rent and students amongst us who may not have switched their licenses. Forms of ID that are acceptable on their own­–aside from Iowa IDs/driver’s licenses–include military IDs, passports, veterans IDs, and the newly issued Voter ID Cards. Voter ID Cards have been sent out by the Secretary of State free of charge to each registrant’s listed address if they have not appeared to have an Iowa ID/driver’s license in the state database. If such a registrant changes names, address, or party affiliation and they are reliant upon their Voter ID Card, then they should get a new one issued that reflects the change. That issuance is best handled by the County Auditor, which may run them a trip to the Auditor’s office or printing and mailing costs. Now is as good a time as any to check in with the Secretary’s voter registration page to verify your status as a registered voter and your polling place. Those with Iowa IDs/driver’s licenses can update voter registration online, everyone else should submit their registration form to their respective County Auditor. As for timing of implementation, the registered voters in the 2018 calendar year will be asked to show their ID at the polls, but they will not be barred or restricted from voting without an ID according to the Secretary. Importantly, anyone who does not have any of the above forms of ID will simply be asked to sign an oath verifying their identity and can still cast a regular ballot upon the issuance of that oath. Come 2019, however, one form of the above IDs will be required. A voter without any form of the above IDs may have another voter attest to their identity on site or will have to vote on a provisional ballot thus facing the possibility of further scrutiny. Any additional questions or action requests can be directed to the Secretary’s office (1-888-SOS-VOTE or sos@sos.iowa.gov). Your local County Auditor’s office is a great resource for addressing any concerns as well. You can find your county listed here. Should I Stay Or Should I Go Now? Homestead Sign-up Online or In-Person? Apprising borrowers of their rights and means to claiming their Homestead Credit is that extra effort that helps your clients know they are in good hands. To that end, our hard-working associate, Jeffrey Perkins, has compiled a list of counties in the mid-Iowa market area, with reference to their respective assessor’s address and website, so you will have that information readily available when it comes time to have that discussion. As of 2017, a small handful of counties have made accommodations for your clients to apply for their credit online. 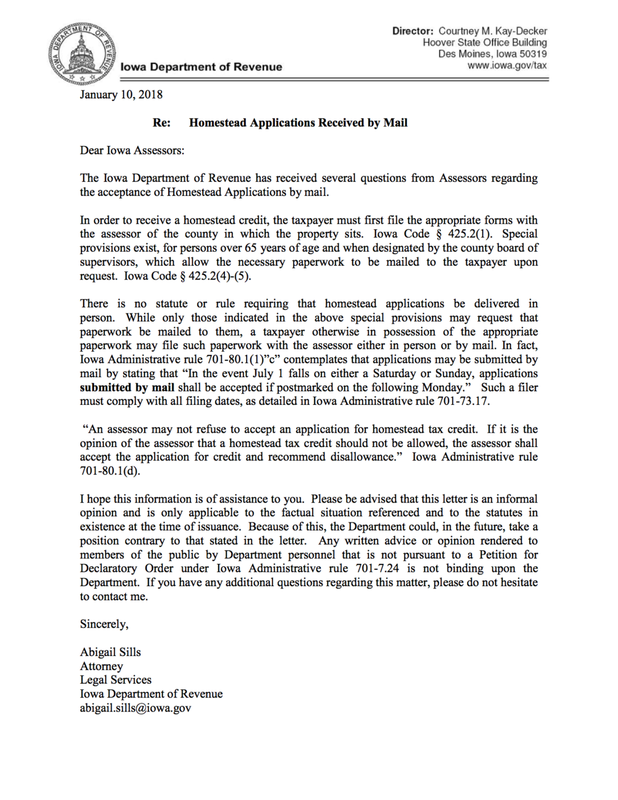 Otherwise, the Iowa Department of Revenue rules state they have the option to either mail their application into the assessor’s office or appear at the assessor’s office to fill out the form on-site. Please note there are still some assessors that prefer your client show up in person. While that is technically against state law, and we’ve spoken at length with the Iowa Department of Revenue on the subject (and they agree), we’ve indicated those offices with an asterisk so that your client can confirm their level of obstinacy before sending. As always, our team is available for any questions you may have. Please enjoy your New Year festivities! Rushing to the County Treasurer to Avoid the 2018 Property Tax Cap by Prepayment? Not So Fast, My Friend! While scarfing down a quick hot lunch on a ridiculously cold Iowa day (below zero at the time of writing), I came across the following article on CNN.com: http://money.cnn.com/2017/12/26/pf/prepay-property-tax/index.html. It appears that in high-dollar property tax states, homeowners are lining up to prepay their property taxes by year end in order to avoid the $10,000 deduction cap recently adopted pursuant to The Tax Cuts and Jobs Act, now efficiently renamed to comport with parliamentary procedure as the "To provide for reconciliation pursuant to titles II and V of the concurrent resolution on the budget for fiscal year 2018" Act (it’d be hard to make this stuff up). 1. Is this really the most effective use of your dollars, even assuming you’ll realize the deduction? Might that money be more effectively utilized in some other higher-yielding investment with a more certain return? 2. Will your county allow for prepayment? And if not, will you be able to effectively petition for a county policy revision in time to realize the gain? 3. What will the IRS have to say about this action? I’m betting a lot. Bear in mind that the IRS has not weighed in with guidelines and regulations governing implementation of the bill. Will a payment made in 2017 for taxes upon the homestead applicable for the fiscal year 2018 be deductible irrespective of when made? If you’re in a state like Iowa where property taxes are paid “in arrears,” what will be the effect of that retroactive annual taxation? Will it bode more favorably (i.e. a 2nd half property tax installment payment due in March of 2018 is actually applied to taxes imposed upon the property for the period of January through June of 2017)? Will that cap be imposed upon 1st half property tax payments due in September of 2018 for the tax period of July through December of 2017? Those are really big “if’s”. Be aware that most, if not all counties, will decline to estimate taxes and/or accept tax payments that are not yet “certified”. 4. If you do take the plunge, you’ll want to be doubly sure that your payment will be effective in the current fiscal year. Each county in Iowa, for instance, has some discretion as to how they accept payment, and as to how they credit payment. So, as the article astutely points out, you’ll want to ensure you get the check there appropriately. 5. Do you itemize your deductions? If not, then you won’t be able to deduct state and local taxes anyway. There are also some considerations to be made for those subject to the Alternative Minimum Tax. Have you spoken with your CPA? It would be wise. 6. Do you have an escrow account as a condition of your mortgage? Have you contacted your lender about your prepayment plans? Lenders, under federally-backed mortgage loans, have strict rules for handling escrow funds and for dealing with excess taxes and insurance (an excess being created by your prepayment). Furthermore, you’ll want to ensure that the rate of tax collection for purposes of escrow in 2018 is adjusted for the prepayment. Overpaying into escrow is likely not a wise strategy. According to SmartAsset.com, the State of Iowa has an average effective property tax rate of 1.44%, ranking it as the 14th highest rate in the country. So, if Zillo is correct, and the median home listing value in Iowa stands at $169,000, that amounts to a tax bill of about $2,500 - well below the $10,000 federal cap. Perhaps it’s much ado about nothing (unless of course, your house is worth in excess of $700,000). So if you have money to burn, tread lightly, and if you don’t, it may not be best to tread at all. **Please keep in mind that I am not YOUR attorney, and that the above is not intended as legal advice for your individual circumstances. Seek out a qualified attorney and accountant or CPA for proper advice on the foregoing. Do you remember the show, “Everybody Loves Raymond”? Maybe everyone loved Raymond, maybe not. One thing WE know for certain, though, is that “Evvvvvvvveryone Loves Barb”! Barb is our rock. She’s a dedicated ambassador for our clients and the firm; she’s an exceptionally talented paralegal; and she handles even the most difficult of problems (and people) with absolutely the most positive demeanor I’ve ever had the opportunity to witness. It’s infectious! She turns even our most difficult days at the office into a smile-fest! Haven’t met Barb yet? You should.